How come every time I diet to lose weight, it gets tougher to burn off the fat each time? Because dieting – if done improperly – will stomp your metabolism into the ground! Simply stated, your body has learned to become “thrifty” and adapted to its situation. 6.2 Why do six small meals a day work? 9.1 Who should follow a 1,200 calorie diet plan? 10.1 What is the glycemic index? 11.1 Ten ways to gain fat-burning momentum. 12.1 Green tea to burn fat? 16.1 “Hidden” calories that can sneak up and halt our weight loss efforts. As an analogy for how weight loss works, let me use a real-life illustration to make this perfectly clear: Right now, you’ve got a job and living expenses. You’re accustomed to a certain standard of living, and the rent and bills get paid. Well, what would happen if you suddenly lost your job? Hopefully, if you’re an intelligent and resourceful person, you’d find another way of obtaining income. In the meantime, you’d cut back on some or all of your spending (or find ways to hack away the “non-essentials”) to make sure that the rent and bills still get paid, so that you don’t end up with the electricity cut off or out on the street. In short, you’d adapt to your newfound situation. It wouldn’t be pleasant or comfortable, but you’d survive until you found that next job. Your body has a “household budget” as well – a minimum number of calories that are required to run all of your daily functions, so you don’t die (little things, like digestion, respiration, heartbeats, thinking, elimination, etc.). Panic alarms sound loudly throughout your system. Instantly, your liver begins mobilizing and breaking down muscle tissue to create some fast energy (by converting that hard-earned, metabolically active muscle tissue to sugar). Your body also undergoes other metabolic and hormonal shifts that conserve energy, so it doesn’t have to “spend” as much to keep things running (keeps the costs down). Your body then stays in this downgraded metabolism, mostly due to the lost muscle tissue. When you break the diet and return to your “normal” eating habits (95% of people do! ), your body is primed to soak up all those calories like a sponge. Even worse, you accumulate fat faster because your metabolism is lowered (causing you to burn fewer calories daily) and your intake is the same as it was before (not down-adjusted to account for the drop in metabolism). End result: A fatter, more frustrated you! Definitely not the outcome we’re looking for. So what can I do to avoid this scenario? The best advice I can give you is to read out article on natural metabolism boosters, forget everything you think you know about dieting, fat burning, and weight loss, and join our free newsletter, immediately. Hey, you don’t have to follow our diet plan, our exercise recommendations, or any of our strategies, but at the very least, you owe it to yourself to find out what happens on a physiological level, so you don’t make the same mistakes 95% of people do. Fat loss is psychological. Turn yourself into an informed consumer! I’m here to offer you help in reaching your fat loss goals. Losing weight and keeping the weight off is a long-term commitment, but you can certainly score some quick wins on the scale to the tune of 10 pounds in one week. Keeping it off, and losing more fat down the road requires determination, willpower, and common sense. There are 100’s of weight loss tips available, and the ones listed below are probably not new to you, but they are the ones that helped me lose over 40 pounds. I lost the weight slowly, but have kept it off for 7 years now. Hopefully the tips will be useful to you as well! 1. I didn’t go hungry. Most people who are dieting don’t eat enough, and then they get so hungry that they give up. It’s better to eat a little too much than not enough. 2. I had patience. A lot of people get too impatient and give up when they don’t see results as quickly as they want. People need to realize that there is no “short-cut” to losing weight. Sure, you might lose a few pounds with the latest fad diet in a short amount of time, but you will put the weight right back on (plus a few more pounds) as soon as you start eating regularly again. 3. I honed my habits. Your daily eating habits are very important in controlling your weight. A good way to reduce weight is to choose foods that are lower in calories for the meals you have every day and for snacks. All you need to do is pick foods you eat regularly and then look for lower-calorie alternatives. 4. I was drinking more water. Drinking sparkling water will help curb your appetite by making you feel full and by boosting your metabolism. A good formula for knowing how much water to drink is to multiply your body weight by .66 to get the required number of ounces per day. Water is necessary for the metabolism of your stored fat. Another way to use water to lose weight is to drink a large glass of ice water just before meals. The cold causes your stomach to shrink slightly, making you feel full faster. 5. I was eating smaller meals throughout the day. Smaller meals keep your hunger down, so when mealtime comes, you will not overeat. Space the meals out to about one every 3 hours. 6. I hid tempting snacks. If they are out of sight, it will be easier not to eat them. When you do have a meal, try to avoid snacking after dinner and before bed. By skipping night snacking, you can cut calories and will most likely wake up hungry and want to eat breakfast. Eating a healthy breakfast is a great way to start your day. Your body needs the fuel and skipping breakfast can cause a 40% drop in your metabolism rate. 7. I didn’t go grocery shopping when I was hungry. You will be more likely to buy the high sugar and fatty snacks if you are hungry than if you go shopping on a full stomach. 8. I kept a journal of what I ate and when I ate it. Doing this will help you identify areas of weakness. Once recognized, you can come up with ways to avoid those weak areas. 9. I made sure not to eat while watching TV, reading, or driving. You will be too distracted and will most likely eat more than you intended. When you are not focused on your meal, you may not feel that your hunger has been satisfied. Try to eat foods that force you to slow down such as hard-boiled eggs that you have to peel. The time spent on peeling the egg is less time you’ll spend eating. Also, you tend to eat hot foods slower, such as soup. Anything that lengthens your meal is good for weight loss. 10. I set a specific time frame of 1 week to lose my first 10 pounds to get myself motivated. The thought of slimming down for a special event such as a vacation, wedding, or family reunion could be your key to success. Just be careful not to be too aggressive with your goal and get discouraged if you haven’t lost as much weight as you wanted within the time frame you set. 11. I stopped weighing myself more than once a week. If you weigh yourself more often than that, you might not see any improvement in your weight and can become discouraged. In fact, it might be better to use a measuring tape instead of a scale. Then you can measure how many inches you’ve lost instead of worrying about pounds. 12. I didn’t beat myself up over setbacks. Don’t beat yourself up if you overeat, especially at a social event or special occasion. All dieters have good days and awful days. Just get back on track as soon as possible. 13. I rewarded myself once I reached each weight loss goal. Keeping your eye on the prize will be a great motivator for success. 14. I started exercising! You can shed pounds faster with just 30 minutes of exercise a day. Walking is a great way to get exercise, even if it’s just walking up and down the hallway at work. 15. I didn’t feel like I was being deprived when others were eating certain foods (I have some secrets to share with you). Your mind is telling you that you “can’t” eat these foods. Tell yourself that you choose not to eat certain foods. And, since it is your choice to improve your health by losing weight, you are not being deprived – you’re making yourself better! If you stop reading here and take action, you’ll be better off than 99% of the folks starting a weight loss journey. I wish you good luck, and I hope these tips help someone else for good karma. Setting an attainable goal is the first place to start when beginning a diet. Some people choose a clothing size they’d like to get to, or a set number of pounds to lose. But numbers are not the only way to set realistic weight loss goals. I have lost 40 pounds by making small and continuous lifestyle changes. It had taken several months to lose that much weight, but I can maintain my weight loss by setting realistic diet plans. 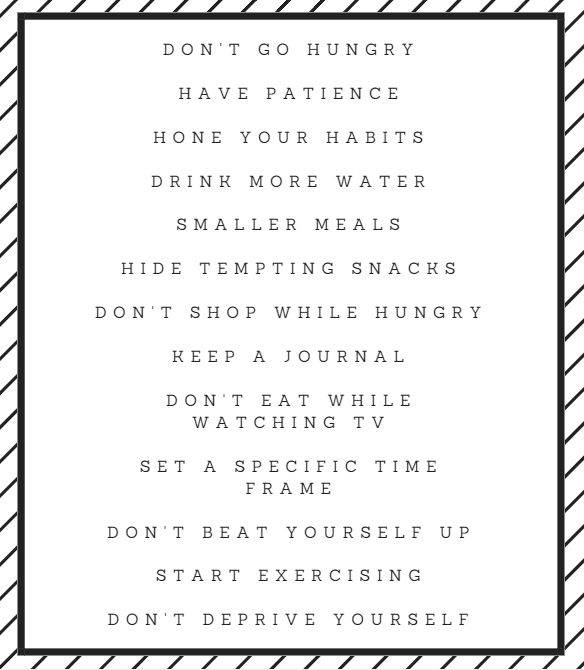 I am aiming to lose another 10-15 pounds with these goals. Lifestyle changes are more important than actual numbers when setting realistic weight loss goals. If you want to maintain a healthy weight, you have to make permanent changes to your lifestyle, including making healthier food choices and adding activity to your day. Fast weight loss is not only unhealthy but when you return to your regular way of eating, the pounds will return. To lose weight and be healthy, you should aim to lose no more than 1-2 pounds a week for a realistic weight loss goal. This goal can be achieved through a combination of cutting calories and adding exercise to burn an extra 500-1000 calories each day. Goals can and should be adjusted as you make progress. Once you’ve lost some weight, you may find you need to change your weight loss goals, especially if you feel you haven’t reached a healthy weight yet and the pounds are no longer coming off. Now is the time to re-evaluate and change your goals. Just be sure your goals are realistic, and you don’t expect too much at once. Finding your “ideal” weight when setting realistic weight loss goals. By slightly cutting your calories and adding daily activity or exercise, your body will eventually come to a healthy weight. This means that after a while you will get to a weight that you sustain without cutting more calories or adding more activity. This weight may not be as low as the number you first set as your “ideal” weight, but it is a more realistic and healthy weight you should be at. Remember that muscle weighs more than fat when setting realistic goals. Although you may wish to weigh 110 pounds at 5’10”, that may be an unrealistic goal for your body, especially if you add strength training to help you burn calories. Since muscle weighs more than fat, you may lose several inches around specific areas of your body, yet still, the scale will show minimal movement. If you look and feel fit and healthy, there is no reason to try to continue on a diet plan to lose more weight. Talk with your doctor about setting realistic weight loss goals. Before beginning any weight loss program, you should talk to your doctor. Your physician can help you to set appropriate weight loss goals based on a variety of factors including your health. By communicating with your doctor, you can learn how you can lose weight, be healthy and still set realistic weight loss goals. Many of us have read that six small meals a day is a great way to lose weight. And, it’s true. I’ve found that spreading my meals into six portions each day helped me lose weight quickly. But it’s not just that simple. If you’re still looking for a quick fix for weight loss, there still isn’t one. Eating six meals a day can work well for you if you’re also doing the other things you need to do to lose weight; eat fewer calories, eat healthily, nutrient-dense foods, and; exercise. For some people the diet plan is eating six meals a day, this becomes a slippery slope allowing them to eat more and poorly. It’s essential to this strategy to count your calories, at least estimate them. Otherwise, you could quickly eat more, not fewer calories, and not lose weight. An online calculator can look at factors such as your current weight, activity level, and gender, to give you a good idea of how many calories you should eat a day to lose weight safely or ask your doctor. But, you still can’t just eat small amounts of nothing but junk. If your nutrition is of low quality, you’re never going to feel full, and you’re going to become nutrient deficient and vulnerable to disease eating fewer calories. And of course, without exercise, your weight loss will slow, and even if you lose the weight, your body may still appear flabby and unfit. Why do six small meals a day work? Eating throughout the day instead of allowing yourself to get hungry for periods of time during the day can help curb cravings and any need to binge you might feel when going too long between meals. This allows you to eat fewer calories without feeling deprived or getting too hungry. Also, it can help keep blood sugar levels steady. I found this strategy hugely helpful when I was training especially hard. By eating throughout the day, I had the strength and fuel to workout whenever the opportunity arose during my busy days. It forced me to plan and prepare my meals in advance carefully and helped me with my issues with binging. If none of these things are problems for you? Eat three meals while trying to lose weight, sure. You are perfectly capable of losing weight this way as well as long as you reduce your calorie intake and increase your activity. Again, there is no magic solution. Losing weight takes time and hard work. But any sound strategy you find that works for you is a huge advantage and leaves you more likely to achieve and maintain your weight loss goals. Portion control has always been a big issue for me. I come from a family with a lot of kids and if we had any hopes of getting seconds of something we had to clear our entire plate first. Many us have a ”get our money’s worth attitude,” and because of that, we feel bad leaving anything on our plate at restaurants that give us enormous portions. That being said, there are ways to curb these attitudes little by little, although I will tell you it is a process. It takes time to retrain your thinking and behavior. Of course, you can go out and buy those 100 calorie packs, which I have done. However, they don’t always have the snacks you want, and then you are left with choices that may not keep you on the proverbial wagon. Go out and buy the re-sealable snack bags. Choose a snack you like and when you get home from the store divide the entire package of your meal into the re-sealable snack bags. Put only what amounts to an actual serving size into the re-sealable bag and then place them in your pantry like that. When you are hungry for a snack, you will take one re-sealable bag of your favorite meal rather than take out the entire large package it originally came in. When cooking dinner for your family, prepare only the food that is needed, don’t make extras. If you serve a balanced meal with the correct portion sizes for everyone, there will be no leftovers to tempt you later. This step seems daunting, but once you start doing it regularly, you won’t even have room for seconds. Additionally, if you and your family sit down together, converse and eat slowly, you will be less likely to desire seconds anyway. Eating slowly gives you more time to feel full from what you have just eaten. If you eat the correct portion at dinner, it gives you room for a small portioned snack. Dining out at restaurants and eating fast food is probably one of the most significant issues many people have concerning weight loss. There are a few things that can help you stay under control while eating out. First things first, when you are eating at a fast food establishment, never order from the quick meal menu. If you are ordering by number chances are you are packing on unnecessary pounds. Look over the list and choose wisely. Never get fries or a regular soft drink. Get a side salad rather than fries and a diet soda or water rather than a regular soft drink. If you want a burger, choose a regular burger. Don’t get a double cheeseburger or a quarter pound burger. Chicken may seem like the natural choice, but getting breaded chicken can often be worse than choosing a burger. Select grilled chicken over breaded every time. Always know what your recommended daily calorie intake is. Knowing this will help you make the right choices for your diet. Knowing your recommended calorie intake may also allow you the ability to have room for the occasional luxury when you have been behaving yourself. A 1,200 calorie diet plan is the least amount of calories that a person who is looking to lose weight is recommended to follow. In fact, a 1,200 calorie diet plan is usually only prescribed to women as men who are looking to lose weight should consume at least 1,300-1,500 calories. It is possible to lose weight and still have a healthy and nutritious diet on 1,200 calories a day. Whenever you follow a diet plan like that has restricted calories you should be sure that the food you are eating contains as many nutrients and vitamins and is healthy as possible so that your body can still have the energy to work and you don’t end up lowering your metabolic rate rather than speeding it up. Who should follow a 1,200 calorie diet plan? Before anyone starts a diet plan, they should consult their doctor to be sure that they are in proper shape to be following the specific diet. A doctor can for sure let you know if a 1,200 calorie diet plan is a good idea based on your height, weight, and physical activity. For some people, 1,200 calories a day may not be enough, especially if they are active while for others 1,200 calories a day may be the perfect formula for weight loss. When you are consuming only 1,200 calories a day, it is essential that the all the calories that you are consuming are also providing your body with essential vitamins and nutrients. Meaning, instead of eating a handful of potato chips for 150 calories a person could have a small salad or whole wheat crackers and low-fat cheese instead. A healthy 1,200 calorie diet plan that will help you lose weight and make you healthier should include plenty of fruits and vegetables, lean proteins, low-fat dairy items, and whole grains. The great thing about these foods is that you can eat a lot more of them for the same calorie amount of smaller portions of unhealthy food. For example, instead of eating a doughnut for breakfast that has approximately 250 calories, eat an egg-white omelet with vegetables and a piece of whole wheat toast for the same or slightly fewer calories. If you are looking for a 1,200 calorie diet plan example to get you started on your weight loss plan, here is a very simple menu sample to get ideas from. Any fresh fruit or vegetables such as a large apple or orange, 25 grapes or a half green pepper with tablespoon low-fat dressing. When it comes to following a 1200 calorie diet plan the quality of the food is key to executing the program and losing weight. Imagine that you can eat all of this food on the 1200 calorie diet plan sample or one value meal from the local fast food restaurant. Wouldn’t you want to be able to eat five or six times a day rather than just once? A big part of healthy eating relates to the glycemic index of the foods you eat. Glycemic index (also known as GI) is a term referring to how quickly energy is released from foods as you digest them. Low GI foods are foods which absorb and release slower into the bloodstream. You may be aware that I’ve quite forcefully stated in other articles that insulin production across the day closely correlates to how effective your diet is for fat burning. Fat burning relates to a state called ketogenesis. Ketogenesis – not to be confused with the unhealthy state of ketosis – refers to the physiological state in which the body uses fat for energy. The ketogenic state is vital because during ketogenesis the body’s insulin levels will be unusually low. Low insulin levels occur when blood glucose levels are low. If there is no glucose in the blood insulin is not required (its presence is lethal under low glucose conditions because hypoglycemia will occur if insulin is introduced to the bloodstream when there is no glucose to clear out). Thankfully, in the absence of glucose, fatty acids are accessed from the fat cells to serve as alternative energy sources. In ancient times we would have used both systems during a typical day. Fat burning should serve as the primary energy system in a healthy body for going about routine daily activities. The glucose-driven system is meant for fueling bouts of intense activities – often over short or intermittent duration – such as fighting and hunting. Under modern conditions, you should run mainly on the fat burning metabolism for most of the day, when doing routine work-related activities (even if your work is manual). The glucose system is only required intermittently when you exercise or when you come across activities which require more intense exertion. This exertion will be increased, so its duration needs to be short or intermittent if it is to be sustained. Under modern conditions that would be when you exercise in some way or when you engage in particularly demanding physical work (no routine work will be of such an intense nature, or else you’d not be able to do it routinely, day after day). What this explanation of energy systems explains and illustrates is that most of our eating should be relatively light. It also suggests that bigger meals, which release large amounts of glucose into the bloodstream, should be consumed around the times you exercise intensely. What this means in practice is that your most nutritious meal should be closest to when you work out. It also suggests that high GI foods should be consumed close to the times you exercise, where possible, and that you should base most of your eating around slow-releasing low GI foods to maintain ketogenesis. This brings us onto an interesting concept – the possibility that the so-called GI rating of a portion of food may be variable. Some foods are low GI (slow releasing), and they will always be such (they will release slowly under all conditions – which is good). This explains why you won’t go wrong sticking to low GI foods all the time. However, high GI foods will typically release quickly into the bloodstream under normal conditions. This is not ideal for reasons of ketogenesis. But, if you were to eat high GI foods after eating a substantial quantity of low GI foods first, could there be the possibility of reducing the glycemic index of those foods because they would pass through the digestive system slower, they would be digested slower and absorbed slower. This implies the effective GI will have reduced. In practice how can this be achieved? I would suggest you only eat fast-releasing, sugary foods last in your meals. This way, they will be caught in traffic. Often, low GI foods will be more fibrous like vegetables, and slower to digest so that they will remain in the gut for longer. Thus, if eaten first, and in more significant quantities, they will cause ‘congestion’ in the stomach, holding up the high GI foods from passing through the system quickly. Foods like vegetables and complex carbohydrates like brown rice and bran will do this quite well. They will reduce the insulin spike usually caused by high GI foods and will allow you to eat some high GI foods without totally ruining your goals for maintaining a healthy ketogenic diet. Just remember to save those treats for last, if you want to make the most of this effect. One final tip for maintaining a healthy, ketogenic diet is to eat in the way people with insulin-dependent diabetes are advised to eat. They are told to follow a low GI diet – but they are also required to minimize insulin usage and keep insulin requirements predictable. To do this requires a predictable glucose profile in the blood and a controllable glucose secretion profile. If you learn to understand the eating advice for insulin-dependent diabetes, acting as if you are minimizing insulin use to avoid hypoglycemia, you will be successful in reducing insulin secretion which will allow you to burn fat more which will make you leaner and healthier. Fat indeed is the ‘enemy’ – it makes us ill for a wide range of reasons, mainly linked to the toxins which accumulate easily in fat tissue and the actual hormones and enzymes secreted by fatty tissue. The only way to minimize those unfortunate aspects of fat mass is to reduce the amount of fat tissue on your body. In case you need reminding of the dangers caused by excessive fat levels, they are diabetes, cancer, and heart disease, among others. These are lethal killer diseases. If you are looking to lose weight, then chances are you are in need of a few fast tips to help speed along the process. Weight loss does not have to be a tricky thing if you approach it with a positive frame of mind and make minor adjustments weekly that you can live with. If you slowly change what you eat and how you exercise then over time, you will start noticing significant changes in your body. Ten ways to gain fat-burning momentum. Always drink a glass of water before your meals. Many people start to mistake thirst for hunger and eat when they are thirsty. Try drinking a glass of water before your meal or when you are tempted to snack to help reduce the number of calories you consume and thus lose weight. Eat your starchy carbohydrates earlier in the day. A simple way to promote weight loss when it comes to carbohydrates is to try and eat the more starchy ones such as pasta, bread, and rice earlier in the day. Since these types of carbohydrates are more calorie dense, consuming them when your body is more in need of energy is a smart thing to do. Later on try to consume vegetable sources of carbohydrates as these are quite low calories and will help you lose weight. Keep healthy snacks at your desk. When hunger strikes while you are at work you do not want to be tempted by the vending machine. Everything you find there will likely be extremely high calorie and will not be conducive to weight loss at all. Instead, keep healthy snacks at your desk. Pre-made packets of tuna, low-fat pretzels or rice chips, whole grain cereals and individual packets of protein powder. This will make winning at weight loss one step easier. Workout first thing in the morning. Those individuals who choose to workout first thing in the morning are much more likely to stick with their workouts since there are fewer barriers that come into play. The only factor they will likely need to overcome is their desire for more sleep, so once they can get past this, they will have no troubles sticking to their workout. Additionally, since exercise helps to increase your metabolism, doing it earlier on is beneficial as it will help you burn calories throughout the rest of the day. If you think skipping this morning meal is a sure way to reduce calories and help you lose weight you are very wrong. Your body has been fasting overnight, and it’s crying for nutrients at this time. If you don’t eat, then your metabolism is likely to slow down making it even harder for you to lose weight. Chances are you will be so hungry that you will eat more calories than you usually would at lunch, therefore, making up and potentially even surpassing what you missed from this morning meal. If sticking to your workouts is your biggest challenge then try and find a friend who has similar fitness goals that you can exercise with. This will help you stay on track because you know they are counting on you to show up. If you instead decide to skip not only will you let them down but you will feel guilty for not keeping your promise. You could even place a bet with your friend to see who can lose weight the fastest. Just because your goal is weight loss does not mean that you have to give up ever having dessert entirely. You need to be smarter about the choices you make and ensure that there is plenty of room for them in your diet to accommodate for the excess calories. Some great options are fruit with low-fat whipped topping, sugar-free jello, or a cup of flavored coffee or tea sweetened with some sugar-free syrup. All of these will not do any damage to your diet and will satisfy your sweet tooth. Reduce how much alcohol you consume. While you are working towards weight loss, you will want to limit your alcohol consumption as much as possible because it is going to reduce your will-power to stick to your diet and you will be more likely to cheat with foods you don’t even really want. Also, alcohol itself is quite high in calories, so this is not going to make the process of weight loss any easier. Feel you must drink? Then try alternating one alcoholic drink with one non-calorie beverage such as water or diet soda. Become aware of hidden calories. Sometimes even the most rigorous calorie counters miss certain places where calories are ‘hidden’ and add up. This is particularly common in restaurant meals because you may think you are ordering a healthy dish of vegetables and chicken however what you don’t know is that they may have added a great deal of butter to the vegetables before they arrived at the table. Another source of ‘sneaky’ calories is smoothie type drinks. These are becoming more and more popular and are generally thought of as a healthy meal replacement. However, often because of the amount of food blended into them and their sheer size, their calorie counts are higher than an actual meal. So be on the lookout for odd places where calories may be a lot higher than you are expecting. Try to eat frequent meals. Eating more often is going to do two things to help make weight loss easier. First, it’s going to help you control your hunger levels since you will never be going an extended period without eating and secondly it is going to help keep your metabolism higher. Every time you eat, your body is going to expend some energy in the process of digestion so the more often you can stimulate this the more calories you will burn during the day. So try applying a few of these tips to your diet today. Remember that you do not have to do a complete overhaul of your diet but rather add in new changes as you progress through. It is much easier psychologically to make a few shifts a week than to try and change all your bad habits at once. Green tea to burn fat? By now I am sure you have heard the rumors about green tea being good for your body. It reportedly has excellent health benefits. Everything from cancer-fighting antioxidants to increase your metabolism to burn extra calories. As a safe and natural weight loss supplement, green tea would certainly not do you any harm. Tea drinking is much better for you than soft drinks or coffee. Adding green tea to your diet and exercise program is an easy way to help your body with a little extra nutrition. Not only does this increase the amount of water you are taking in but you have the additional advantage of the antioxidants and metabolism boost. Even if green tea doesn’t help you lose weight directly, it is still great for your body, and people who have a cup of tea tend to eat less at a meal. Antioxidants are beneficial for your body. They help remove free radicals and toxins that can cause many diseases in your body. One of the universal benefits from green tea is added energy. People who drink it feel better and wind up burning more calories because of this extra energy. The Chinese have been drinking green tea for many centuries, and it is a well known natural ingredient in many of their homeopathic medicines. It is reported to cure just about everything. This is a safe supplement that won’t harm you and would be great to add to your diet. Tea doesn’t have very much caffeine in it so you don’t get the anxious jitters that other drinks or dietary supplements can give you. And, you can enjoy the fact that not only are you drinking something that could help you lose weight, but you are getting a significant dose of antioxidants as well. You can take green tea in a variety of ways. It is available in pills, capsules and some people just put a drop of extract under the tongue for instant absorption into the bloodstream. Adding green tea as a fat burner is pretty easy to do, and you will quickly start enjoying a relaxing cup of tea several times a day. Green tea is cheap and easy. It is one of the most natural weight loss supplements and the safest. With tea you aren’t experimenting, tea is proven safe by millions of people every day. Don’t spend a fortune on green tea products, just the basic green tea available at supermarkets is all you need. You will probably have to get used to drinking tea if it isn’t something you are used to. Try several different brands until you find one that appeals to your taste buds. Let’s get this straight right off the bat- there is no medical or scientific evidence that caffeine can make you lose significant weight or even keep weight off. That being said, yes, caffeine can be used to help you in weight loss, but it’s not a miracle cure for getting lean, not by a long shot. Learn how you can use caffeine to help you lose weight, and what you can expect from caffeine in your weight loss goals overall. Caffeine can work to suppress your cravings and appetite. However, if the caffeine you are using to quell your appetite is a liter of soda (even diet) or a large latte with a gazillion calories in it, you’re not going to be dropping any pounds. If you are using caffeine as an appetite suppressant, stick to something like a caffeinated tea with no cream or sugar, or straight black coffee. Or add honey or lemon to your brew with some soy milk. The fewer calories you are using while you’re making yourself not hungry, the better. Better yet, have that black cup of coffee right before you work out, or within a half hour or so of your exercise routine. Caffeine can boost your energy levels, which means you can work out for an extra 15 minutes or so without that crazy fatigue that starts halfway through or that insane hunger you get right after you’re done breaking a sweat. Exercise stimulates appetite, so use caffeine the right way and consume it before a workout to keep you from noshing and keep you exercising longer. You’re more likely to lose weight this way. For a little while, caffeine will boost your metabolism, mainly because your body temperature is raised and caffeine stimulates energy to burn off excess calories. But this won’t burn off too many calories or help you burn more fat. You know what really will give you a boost to your metabolism? Ice water- your body can’t use the water until it’s at your body’s core temperature, which means your body has to heat up the water you drink so you can stay hydrated. When your body is hard at work to create heat, it’s burning more calories than it would just regularly digesting your food, so if it’s a choice between a caffeine beverage or a bottle of ice water, well, you now know which to pick. Caffeine does help with bloat, however, so it can give you relief from those extra pounds of water weight. Just be sure that if you are consuming caffeine, you are not consuming sugar with it (like sugar in your coffee), because the sugar will only make your body hold onto more water. Your best bet is to drink a cup or 2 of straight black coffee (or green tea, well-known for helping in water weight loss, and weight loss in general) and let nature take its course. Then drink up on regular water- your bloat and water retention is likely due to dehydration, to begin with. So while consuming caffeine can help with your weight loss goals, you have to use caffeine to your advantage. More often than not, there are alternatives to caffeine that work as well or better than caffeine does for weight loss, and they don’t come with the side effects of nervousness, upset stomach, and sudden fatigue at wearing off that caffeine usually has. One of the quickest ways to sabotage a diet is to keep unhealthy snacks within easy reach. If you are going on a diet or want to support someone in the house while dieting, start by re-stocking your refrigerator and pantry with healthy choices. Toss: Start cleaning out your fridge by throwing out anything that contains high fructose corn syrup or white/bleached flour. Keep: Keep anything that contains whole grains, and sweeteners such as honey, agave nectar instead of sugar. Buy: Purchase sprouted grain products such as Ezekiel cereal, bread, and tortillas for your healthy pantry makeover. It’s best to store spouted grain products in the refrigerator or freezer so they last longer. Buy crackers that contain fiber and flax seeds such as Mary’s Gone Crackers. Toss: Toss any product that contains MSG, a flavor enhancer that increases appetite. Any snack that includes more than 10 grams of fat per serving or more than 10 grams of sugar. Keep: Baked chips, sweet potato chips, and products that contain vitamins, fiber and nutrients without sugar are the keepers for your pantry makeover. Buy: Seneca sweet potato chips, Snapea snow pea crisps, and air-popped popcorn’s are the best choices for snacking. Stock up on healthy staple foods such as nuts as well as fresh fruits and vegetables for dipping in hummus. Toss: Toss any drink containing high fructose corn syrup or sugar other than natural fruit sugars. Keep: Citrus juices such as grapefruit juice are ideal for dieters. One of the best choices is the Slimming Indian River Ruby Red Grapefruit juice. Buy: For your healthy pantry makeover, go ahead and purchase Zevia natural sodas or Hansen Blue Sky Free with Truvia for times you need a healthy soda substitution as well as healthy teas such as passion tea, raspberry leaf tea or moon cycle tea. Toss: Get rid of frozen diet meals that are high in carbohydrates or white pasta; frozen items high in sodium; convenience meals with more than 10 grams of fat per serving, frozen meals with preservatives, artificial colors or ingredients including MSG. Keep: You can keep diet frozen meals that are low in sodium, higher in fiber and protein and low in sugar. Organic frozen items such as Cascadia Farms organic French fries. Buy: Consider purchasing diet-meal delivery service meals for convenience such as the Bistro MD diet meals that are high in protein and fiber. Toss: Dump any soups containing MSG or a lot of sodium and artificial ingredients. Toss tuna packed in oils. Toss fruit preserved in syrup. Keep:Healthy staple foods include light tuna packed in water; red salmon, sardines in mustard sauce. Keep lower sodium, natural soups such as Amy’s organic soups. Canned fruits such as Del Monte No Sugar Added are also acceptable. Buy: Muir Glen gluten-free soups, canned pumpkin, and Wolfgang Puck’s soups for eating or cooking. Purchase plenty of healthy staple foods such as herbs, organic eggs, cheeses, yogurts that are low in sugar and lean protein sources such as fish, chicken and ground white meat turkey. When cleaning out your fridge for a diet, focus on eating clean. The best options are foods that don’t have a barcode. Yes, just like the cows of the field, moving from one area to another, people graze. At parties, we walk past the buffet or snack table and snag a little something every time we pass. At home, we go to the kitchen to fill our beverage glass and notice this morning’s muffins still on the counter or the ham from dinner still on the stove. We mindlessly scarf up tidbits in this manner adding unnecessary calories as we go. This trait usually falls to the one who cleans up after meals. The dishes are gathered, and the leftovers are packed away in the refrigerator. But what about that last spoonful of mashed potatoes or the piece of meatloaf too small to be used as a portion. We often “clean up” these leftovers too small to be another meal by devouring them. Remember when your kids started eating table food? You would dole out their portions and then fix your plate. Your serving was always larger because, well, they are little kids and you are an adult. But, as they grew and their portion sizes grew, did you adjust your portion too? Often that mentality of eating more because we are bigger than them ensures that we stay bigger them. This is the type of habit involves eating in conjunction with other activities. Perhaps you watch television every night and have grown accustomed to snacking while you watch. The snacking isn’t necessarily bad unless you are not hungry or are not paying attention to the portion size. If you sit down with a brand new bag of potato chips and don’t stop until you hit bottom, you could be in serious trouble. Whether you succumb to the lure of fast food from McDonald’s or the convenience of prepackaged foods from a box or bag, you are depriving your body of proper nutrition and loading up on calories and possibly chemicals that serve no nutritional value. Stay away from the store-bought Macaroni and Cheese, and make homemade. Once you start making time to cook for yourself, you’ll find it doesn’t take all that much more time and your waistline will thank you for it. Many restaurants don’t provide nutritional data on their menus, and when we go out to eat, it’s usually a unique experience for us. We like to experiment with new items and will use more condiments than usual to spice it up. Managing calorie intake is essential in your quest to lose body fat. There are 3,500 calories in every pound of fat, and most people only require 1,200-1,500 calories per day to maintain their current weight. But our quick stops at fast food places coupled with eating out in our favorite diners can derail our fat burning process. “Hidden” calories that can sneak up and halt our weight loss efforts. (1) Soup – Did you know that over 90% of restaurant soups are loaded with fat and cholesterol. We often think of this as a healthy choice, but you may be getting more than your share of other not-so-favorites. (2) Muffins – Even low-fat muffins often contain more than 400 calories a piece. (3) Tuna Fish – Tuna is known as a healthy snack, but most restaurants prepare tuna sandwiches with mayonnaise which loads on calories. The sandwich can have up to 700 calories when mayo is used in preparation. (4) Sauces and dressings – We love the delicious sauces and dressings that are often used on different meats and pasta for varied flavors. But the amount that is typically used will add a ton of extra calories if you’re not careful. To try to reduce them, you can request the sauce on the side so that you can dip and mix your food to taste. a. Skip the soda. Most restaurants offer free refills, and most of us tend to have one or more beverages with each meal. Instead, drink water or have a lovely cold tea. This will dramatically cut the calories you expose yourself to and help you get to your eight glasses of water a day. b. Eat until content. Don’t try to clean your plate. If you’re already satisfied, sit back and let your food digest. Your waist will thank you later. c. Leave room for dessert. If you plan to eat dessert, eat less food during meal-time. Restaurants offer doggie bags, and you can take leftovers home. Try these simple tricks, and you’ll see faster longer-lasting results from your dieting plan!